This article’s goal is to outline the best way to clean laminate floors. To get to that answer we will also outline the most common and basic cleaning methods to get to the answer of the best way to clean laminate floors. Laminate floors as discussed in prior articles have become extremely popular in the residential marketplace. This is because they are durable, relatively inexpensive and a large selection of styles, colors and patterns. If you have a laminate floor in your home or are considering installing one, it is a good tip to check with the installer and the manufacturer of the laminate flooring on how to maintain their laminate flooring. We state this because you will not want to maintain or clean the laminate floor with a method that would void the manufacturer’s warranty. 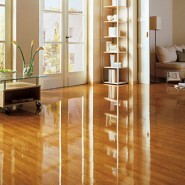 With this stated, all the following outline of clean methods to cleaning laminate floors will not harm laminate floors. But, if you were more interested in daily cleaning procedures for laminate floors, please see a prior article written on routine cleaning for residential laminate floors. (How to Clean Laminate Floors – Cleaning Procedures). Dust mopping is always the first step of any wet cleaning of laminate floors. This task removes all loose soils from the floor. Mop & Bucket – Damp Cleaning with using a traditional cotton mop and cleaning product mixed with water. Sponge Mop – Sponge Mop with a cleaning product mixed with water. Fiber Cloth Mop – A flat microfiber or fiber cloth mop head with a cleaning product mixed with water or pre-mixed in a cartridge like Bona or Swiffer mop systems. Steam Floor Mop – A small (size of an upright vacuum) cleaning machine that uses steam and a microfiber pad to clean. Any of these methods will work well but when you consider the pluses and minuses of each cleaning method outlined above, for the residential homeowner the clear choice regarding the best way to clean laminate floors is the Steam Floor Mop. We recommend this because it has several advantages that the others do not provide. We should mention that is making an investment in a steam mop is not feasible for any of our readers; the Fiber Cloth flat mop system is our second choice for best ways to clean laminate floors. Uses only water to generate steam as the cleaning agent. No cleaning chemicals are required which provides the homeowner with two great pluses; saves money on cleaning product and it is a green environmentally friendly why of cleaning. Some of steam floor mop units also sanitize the floor. Uses the least amount of water to clean which makes it safe for the laminate floor, especially wood laminate floors. Reduces the amount of time to clean as compared to other methods including the set up and storing time of the equipment and supplies. Long lasting life of the unit makes it a good investment for years of use.